The Mouse with the Question Mark Tail is a simple, cute story. Mouse Minor is small…very small…the smallest mouse in the Royal Mews in the court of Queen Victoria. He is constantly getting into fights with his older, bigger classmates. He knows the Headmaster doesn’t like him and when one fight goes too far he flees the Royal Mews altogether. The rest of the story details Mouse Minor’s adventures as he is flung from a horse’s feeding trough to the horse’s ear, to the Royal Gardens and the Royal Guards, back to the palace and even the chambers of Queen Victoria herself! 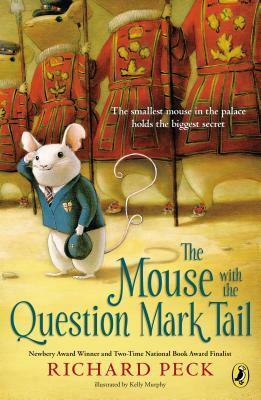 Its tone is similar to Kate DiCamillo’s fantastic Tale of Despereaux but The Mouse with the Question Mark Tail never achieves the rich characters or skillfully complex plot structure of Despereaux. This is a good read-aloud for 7 or 8 year olds. Readers younger than this will be quickly bored by longer descriptive passages that lack energy. Readers older than this will be bored by incomplete character development and long-winded passages of unfulfilling content. If read to the correct audience, The Mouse with a Question Mark Tail will be loved, but I think the target audience for this story is much smaller than average. I love Richard Peck’s work–which is why I wanted to read The Mouse with the Question Mark Tail. Perhaps I am disappointed in the story because I expected so much more. Those readers unfamiliar with Peck’s other work will probably enjoy this story and if so then I recommend his classics: A Year Down Yonder, A Long Way From Chicago and The Teacher’s Funeral. In short: limited appeal to a very specific reading audience.